Thank you for informing about the news on your blog. I am impressed by the work you have done to develop your method to analyse and categorize labyrinths. It is a thorough approach which shows your great experience and knowledge of labyrinths. It is a pity that I was not aware of your approach, because I could certainly have benefitted from your work. It is clear that your approach as well as my approach serve the same aim: analysing and categorizing labyrinths in such a way that links between the various sources of information (books, petroglyphs, graffiti, coins etc.) become apparent and may form the bases for further research. 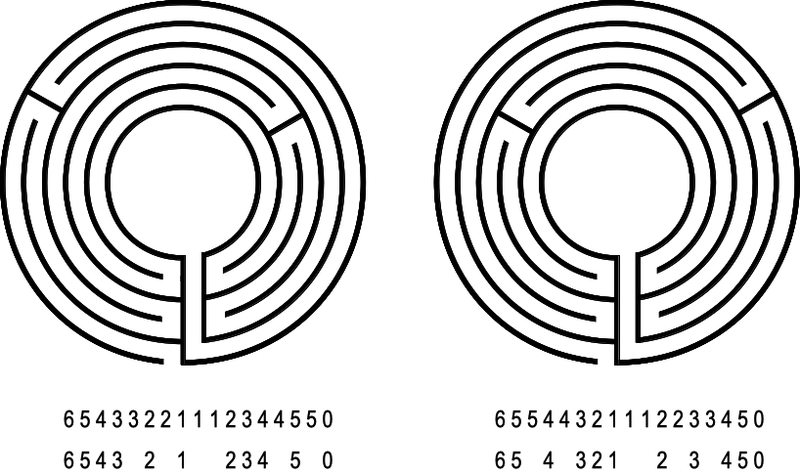 Comparing both methods I get the impression that your aim is also to be able to reconstruct the labyrinth based on the information in your labyrinth library. This is not the case in my approach. You showed clearly that an approach based on the sequence of numbers only may yield a variety of labyrinths. Of course in developing my approach I have considered also the option to add more information to the sequence of numbers. But exploring the boundaries of my approach using the say 230 labyrinths available, I learned that the same sequence of numbers yielded the required links between labyrinths, which I was searching for. This experience does not exclude your remark that in principle more types of labyrinths are feasible given a sequence of numbers and I am convinced that in the course of time a few examples which do not lead to the same family will appear. But there is another reason for me to stick initially to a single set of figures and that is that the simple approach appeared to appeal to labyrinth enthusiasts. It was simple for them to obtain the sequence of numbers related to a labyrinth and search in the labyrinth library for feasible links. For these two reasons, the approach appeared to be sufficient as well easily applicable for a wide audience, I was and still am happy with my approach of a single sequence of numbers. You rightly point out to the parallel between your and my approach. A parallel which however is again clear for specialists, but for one reason or another it did not ring a bell with Jeff Saward nor in the review of Erwin Reissmann. The idea that the labyrinth of Thomas Hill should be a part of the same family as the Ravenna labyrinth is clearly erroneous and it is not my intention to implicate that. 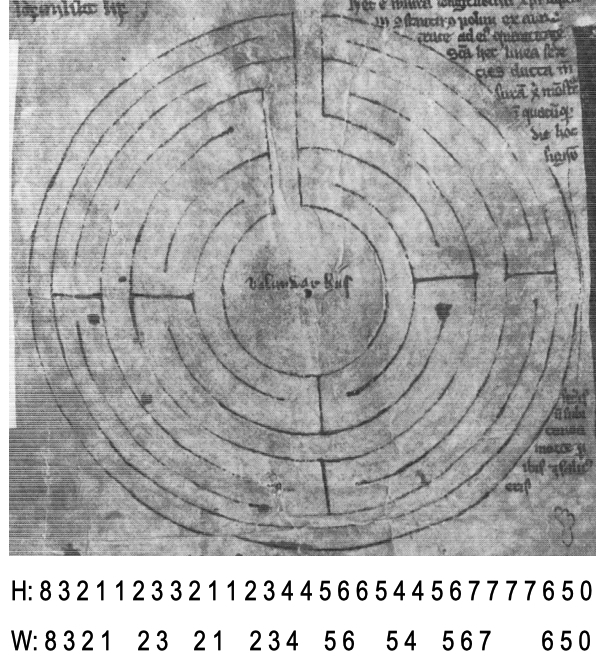 The Ravenna labyrinth is discussed in paragraph 3.3. followed by the labyrinth of Thomas Hills in paragraph 3.4. The fact that placing these two types of labyrinths both on page 81 can easily lead to the wrong conclusion i.e. that they are from the same family, which is clearly not the case. If you have further questions or remarks, please do not hesitate to discuss these with me. Thank you very much for your constructive response. First let me state that Erwin and myself always welcome and appreciate a multitude of approaches and contributions to the subject. And I agree that our approaches have much in common and serve the same aim. And I also am interested in the details and differences. The main purpose of my typology is the same as yours: classifying and comparing labyrinths. 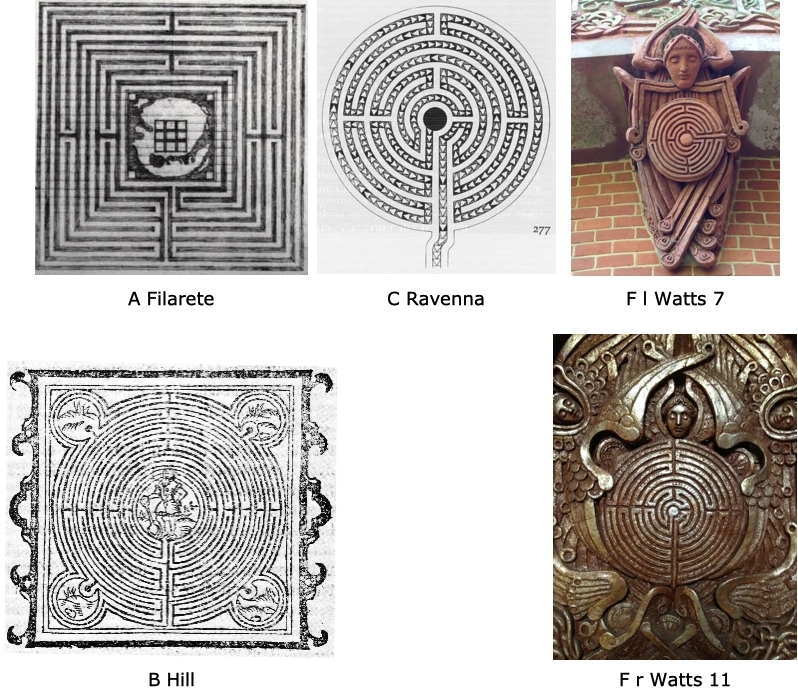 But I also use my tool to identify and classify labyrinths the other way round for the detection or design of new types of labyrinths, which seems not to be your interest. Therefore for me an unambigous representation of the course of the pathway is important. It is of secondary importance, whether a pattern or a sequence of circuits is used. But or me, the notation of a sequence of circuits must be unambigous, or bi-univocal. Of course I respect your approach that has the advantage of more ease of use and the risk of a loss of precision. However, in practice, labyrinths with different courses of the path but the same sequence of circuits may rarely occur. So in such a case a difference – if noticed at all – could be easily taken into account. This brings me to some other concerns. I have continued to chapter 4 of your book. I have the strong impression that you were greatly influenced by Tony Phillips‘ notation. This can be seen from the use of the 0 and (n+1) in the sequence of numbers and from your selection of interesting SAT for the comparison of theoretically possible and empirically existing types of labyrinths. The notation of Tony is strictliy limited to SAT. As you explain, S means one-arm labyrinth. That rules out all labyrinths with multiple arms, whether these are sector labyrinths or else. A means that the path does not traverse the axis, excluding such labyrinths as St. Gallen, Syrian Grammar, Al Qazwini etc., and T rules out any designs that are not strictly unicursal, e.g. multicursal mazes, Baltic Wheels or else. Interestingly in chapter 4 you use the term „types“ for your groups. But this is only a incidental remark and has nothing to do with the issues I see in your figure 4.3.1 comparing interesting s.a.t. labyrinths with observed labyrinths. Among your 6 observed s.a.t., only two, Demeter and Pylos are s.a.t. 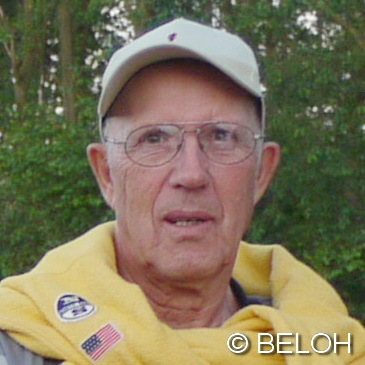 Kato Paphos, Chusclan, Avenches, and Annaba are not S but only AT. Type Manuscript (St. Gallen), Syrian Grammar is only S, non-A, T (the only s.a.t. with 6 circuits and your sequence of circuits 7 4 5 6 1 2 3 0 is example (c) I showed in fig. 2 of my post). Among your 27 observed types but non s.a.t. labyrinths, the types Temple Cowley, Farhi, City Jericho, Hebrew Bible; type fig 230, 228 (not 229) Jericho; type fig 232 Jericho, type C 38-01, and type C 43-55 are all s.a.t, although most not interesting ones. So to me it seems that the way you extended Tony’s concept to types of labyrinths it was not designed for on the one hand and narrowed the range of feasible types to the interesting s.a.t. causes some confusion. In addition I wonder why you reversed the numbering of the circuits from outside-in as by Tony to inside-out?